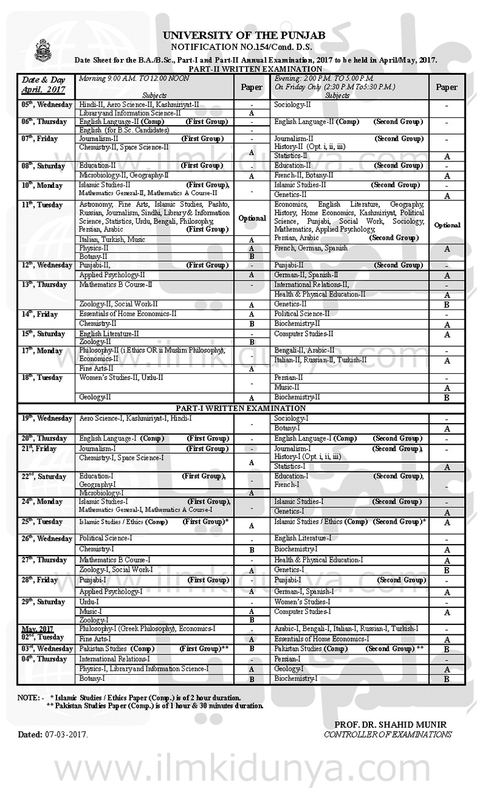 Punjab university BA/BSC Date Sheet 2019 update on Tue 23 Feb 2019. date Sheet of Punjab university BA/BSC is going to be announce soon on ilmkidunya. University of the Punjab (PU) the oldest and largest university of Pakistan every year holds the exams for graduate and post graduate students in various programs. 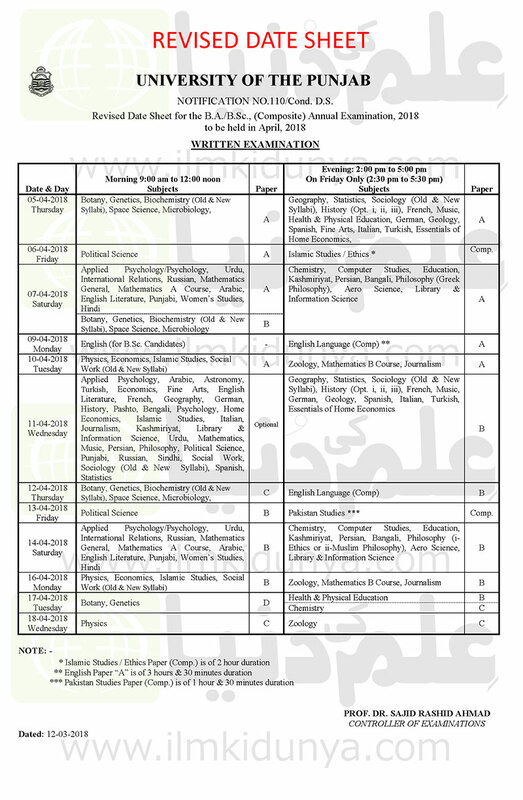 The exams are organized according to prescribed schedules. Generally the board announces date sheets at least one month earlier. The date sheets for BA and BSc annual exams is issued in March and in April the university issues date sheet for B.Com final exams. The university issues the date sheet for MA and MSc annual exams in May or June and exams are commenced in the month of July every year. As soon as the date sheet 2019 of Bachelors and masters program will be announced it will be uploaded at the respective pages of ilmkidunya. Punjab University Lahore was formally created by the British government in 1882 at Silmla. The university is functioning as an authoritative body for organizing undergraduate, graduate and post graduate examinations under various faculties. The university is functioning with multiple campuses in Gujranwala, Jhelum and Khanspur while the establishment of Kasur campus is underway. There are a large number of institutes affiliated with the university and all are a large number of institutes linked with the university and delivering education at graduate and post graduate levels. The university has total of 13 faculties and 63 academic departments, research centers, and institutes. Amongst large-sized multiple faculty universities the Punjab University has been classified as first university by the HEC in 2012. All the students registered with PU and planning to appear in the bachelors and masters degree programs must stay in touch with us for date sheet 2019 updates. 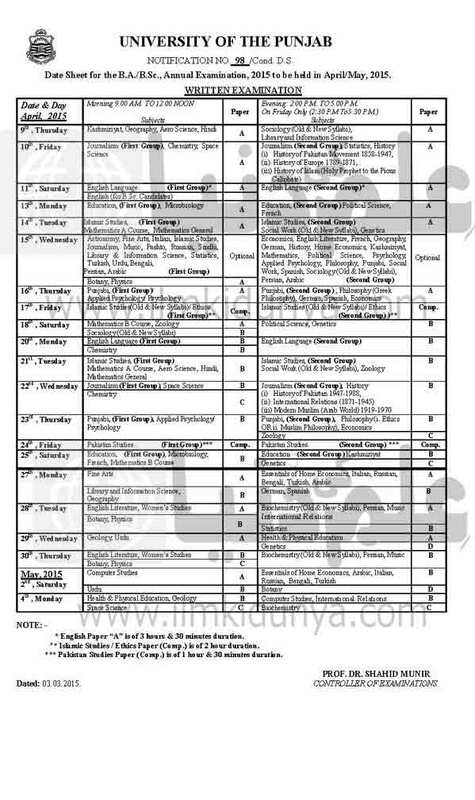 Details regarding previous and upcoming examinations of Punjab University and their date sheets have been given below. You can check the details of date sheets of previous BA/BSc, B.Com, and MA/MSc/M.com examination at following links. Details regarding previous and upcoming examinations of Punjab University and their date sheets have been given below. You can check the details of previous BA/BSc, B.Com, and MA/MSc/M.com examination date sheets by clicking on the links. Do you have notes of MA political science according to PU Sallybus???? Plz tell me Pu offers journalism in English medium or not? BA part 2 ki date sheet jab aye gi ? Computer science se related info dy skty?? 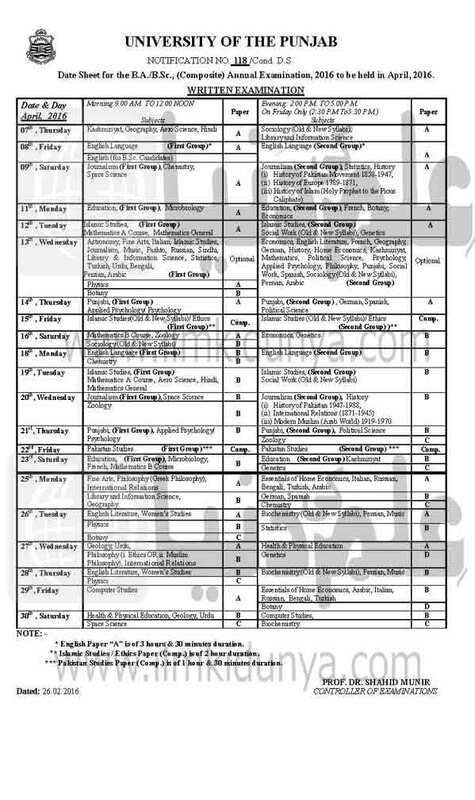 B.A Part 1 ki Date Sheet Kb Ani hy? Ba part II li date sheet kb aey gi......?